Added the ability to control access to the prompt "Zero Quantity On Hand For Missing Tag Items?" when printing the update edit list or posting physical count tags. Some users consider this flag to be dangerous. If the person who performs the physical count or cycle count does not know the meaning of this flag and answers "Y," it could result in losing inventory data. Enter "N" to restrict access; default is "Y." 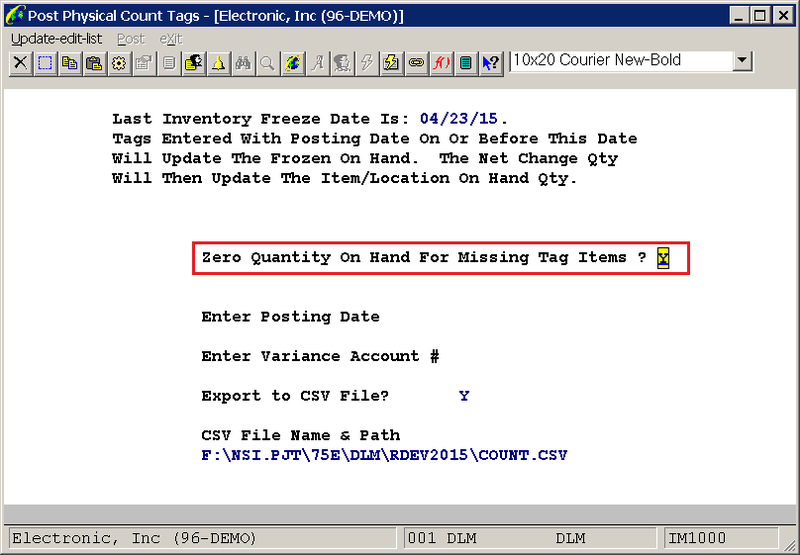 If the Global Setup field above is set to "N," when Post Physical Count Tags --> Update-edit-list or Post is selected, if the user enters "Y" to the "Zero Quantity On Hand For Missing Tag Items?" prompt, an error message will appear. and the program will take the user back to the "Zero Quantity On Hand For Missing Tag Items?" prompt.